Fujitsu-ScanPartner-SP25-ScanPartner Scanner is equipped with a direct paper feeding path mechanism for reliable scanning and a high-precision separation mechanism using brake rollers. This means ScanPartner is able to scan various documents including non-standard documents, such as thin documents (41g / m2 or more) and plastic cards (up to 1.4mm thickness). 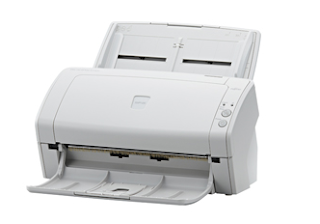 The ScanPartner SP25 is able to scan A4 documents at an impressive 25ppm (color, duplex, 200 / 300dpi). To further improve work efficiency, it is also armed with an ultrasonic sensor to detect multi-feed to ensure scanning is reliable even when scanning large volumes or mixed batches of documents.